Within the parish of Fatima, which is itself a small and modest place, there is a little hamlet called Aljustrel, and to find a less pretentious part of the world, you would probably need an angel for a guide. It is in the precise geographical center of Portugal, some say, though I have never measured it. Actually it is a group of aged and whitewashed houses, some detached and others joined, that tumble at a slight grade down a rocky lane where donkeys and sheep are happy, and an automobile, to proceed in peace, would require the gearing of a goat. 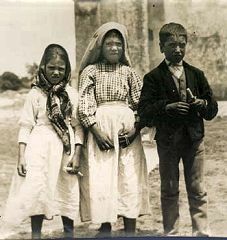 It is little different now from the days of 1917, when it was the home of the three little children to whom our Lady appeared. These children were as ordinary, by all the fair accounts of those who knew them best, as bread and fish, as gaiety and tears, as simple games of fancy, as flowers in the summer fields. They were not conspicuous for their gifts or their delinquencies. It makes me realize that if we look at life correctly through the eyes of our Creator, it is indeed like a poem or a song or the flight of a bird. When you say your rosary today think of Our Lady in the Cova de Iria urging the little victim souls to pray for sinners. It is a good message for all of us. And the first sinner for whom anyone should pray is himself. Lord give me a humble and repentant heart.